Why the desire to take such a personal space outdoors? Possibly, it’s an attempt to reconnect with the way we bathed for the majority of human history. As we become increasingly surrounded by technology, the simple act of using an outdoor bathroom could be an effective way to get in touch with nature on a daily basis. 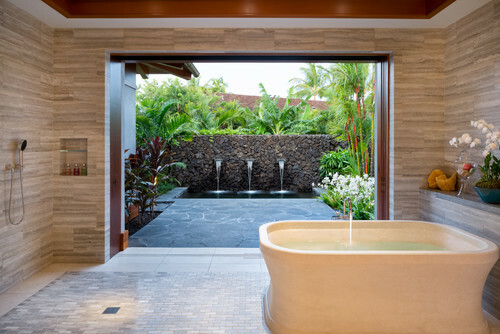 In Hawaii, the trend is commonly based around a traditional Japanese-style ofuro soaking tub, with some incarnations including a shower. 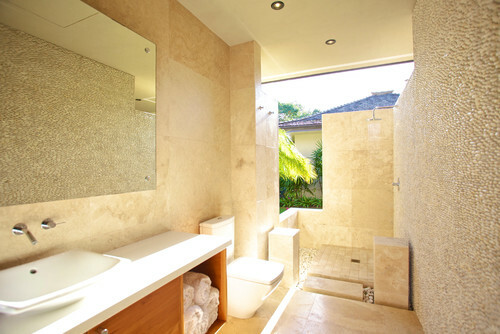 This gorgeous bathroom combines indoor and outdoor bathrooms flawlessly. 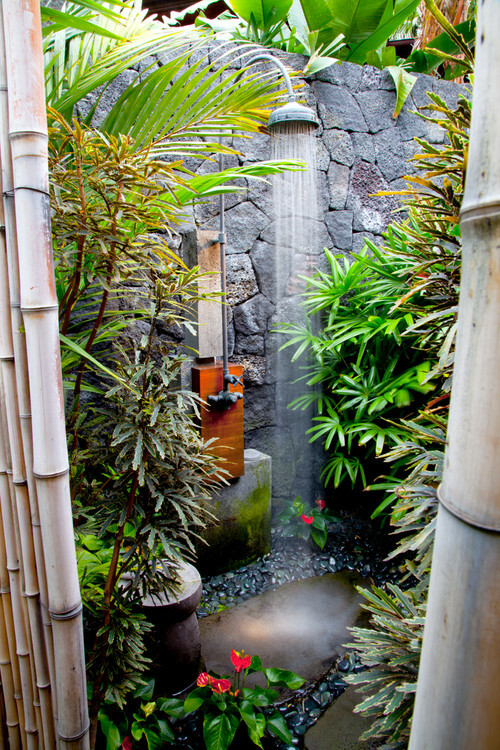 Imagine taking an after-work soak with this serene garden to gaze upon. This is for those who take their outdoor bathing seriously. 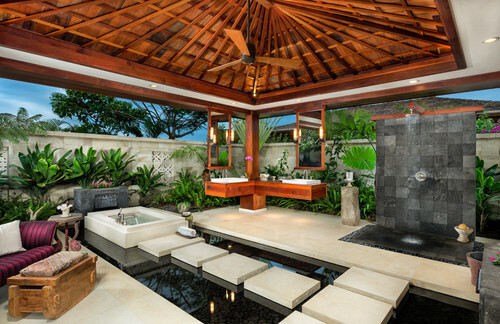 Here, the outdoor bathing area is the focus, rather than a garden or scenic view. 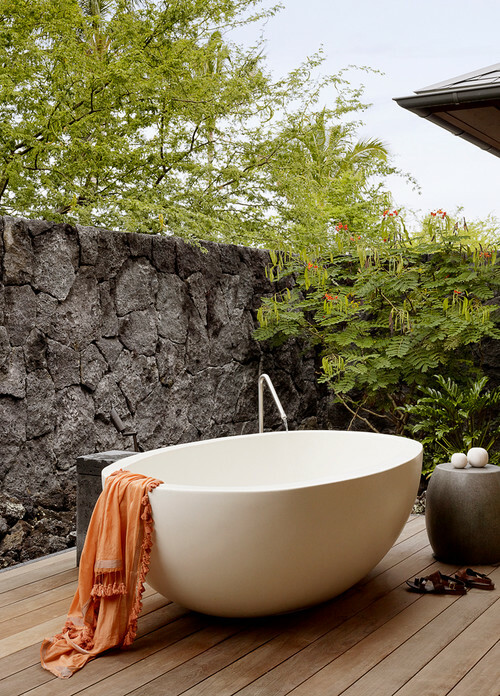 A beautiful standalone tub plus a wide open shower = another wonderful indoor/outdoor mix. Though it lacks a tub, these dual showers are perfect for those who know they wouldn’t get much use out of an ofuro. 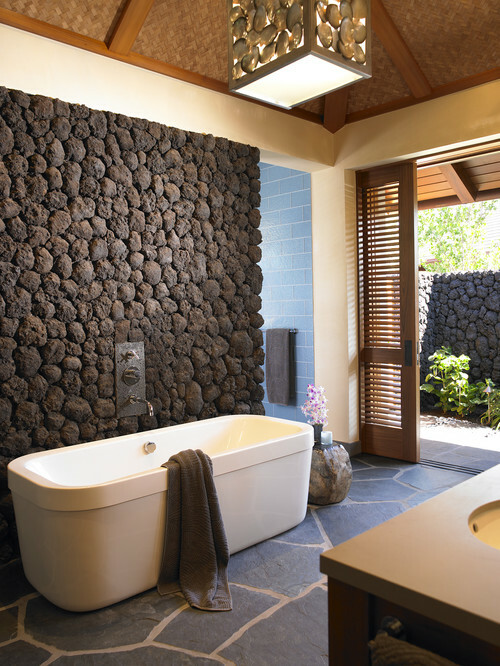 The interior rock wall here blends with the exterior one, bringing the two areas together seamlessly. 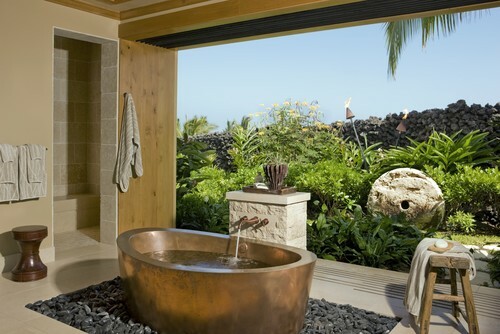 A true outdoor bath, this tub lets you rest in warm serenity in this secluded yet wide-open sanctuary. 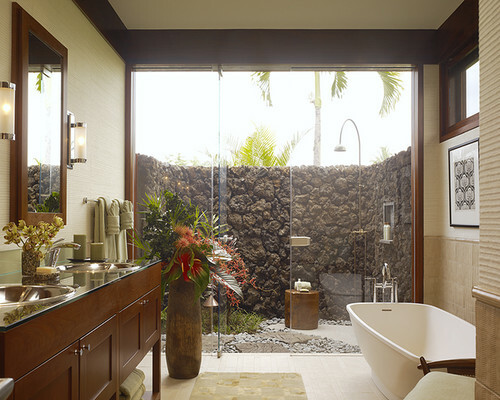 This bamboo and foliage heavy shower area is reminiscent of taking a shower under a natural waterfall, deep in the lush tropical mountains of Maui or Kauai. A thoroughly contemporary addition to the list – this bathroom is more indoors than out, but bucks tradition by boasting glass walls and doors. For the homeowner who trusts his neighbors very, very much. 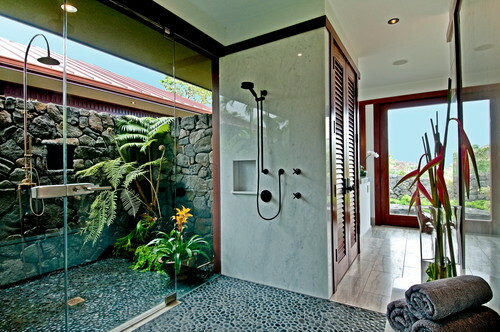 This beautiful Kauai home offers a true outdoor bathroom experience – from toilet to open shower. 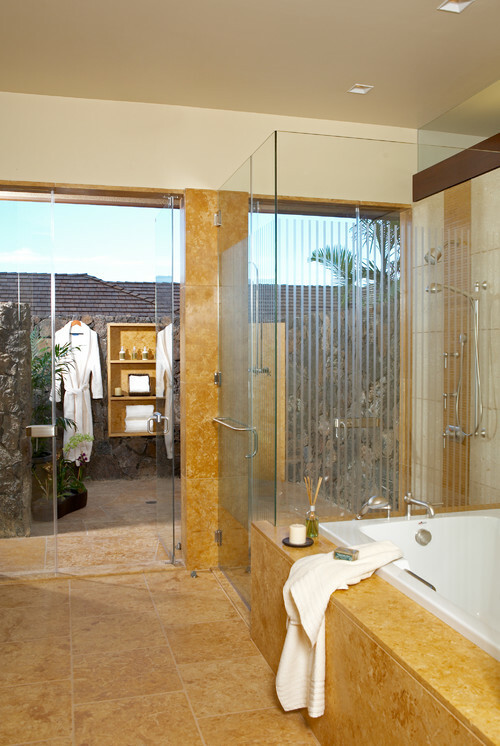 The room was designed to provide maximum privacy for the toilet while keeping the shower area wide open. 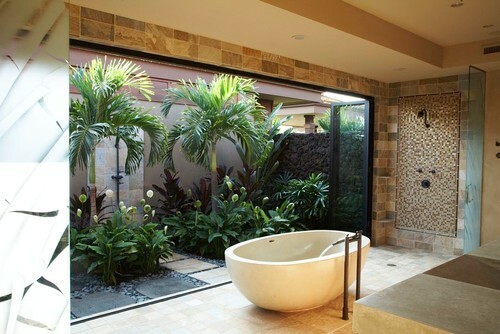 A bonus outdoor bathroom for you – because we care. A truly impressive entry, the outdoor fountains allow for the soothing rush of water even when the tap is off. And of course Houzz for the pictures!